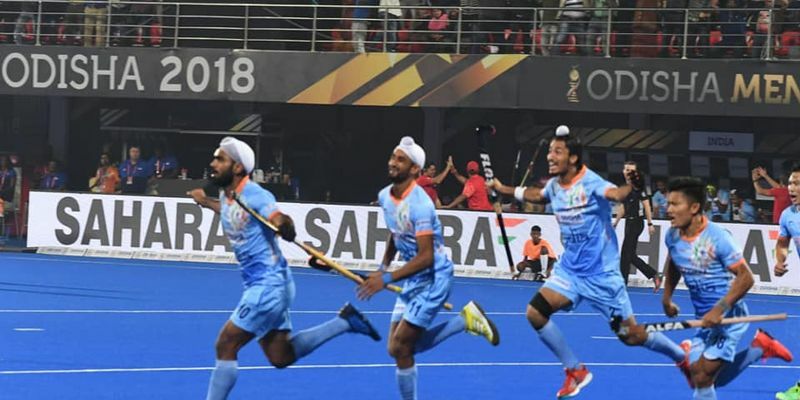 The Indian men’s hockey team secured a spot in the quarter-finals of the ongoing FIH Hockey World Cup in Odisha after a resounding 5-1 win over Canada in the final group stage match. Goals from Harmanpreet Singh, Lalit Upadhyay, Amit Rohidas and Chinglensana Singh earned India top spot in Group C.
Indian men’s team coach, Harendra Singh, will be proud of the grit and determination shown by his squad as the home team registered a convincing 5-1 victory over Canada in their final group-stage fixture in the ongoing FIH Hockey World Cup. In doing so, the hosts’ secured a direct route to the quarter-finals, having topped Group C ahead of Belgium. Lalit Upadhyay, who was adjudged as man of the match in Saturday’s win against Canada, starred for India with an inspiring brace at the Kalinga Stadium last night. Meanwhile, goals from Harmanpreet Singh, Amit Rohidas and Chinglensana Singh gave India the much needed boost they required ahead of the knockout stages. India got off to a positive start as Harmanpreet Singh put the hosts’ ahead with a 12th minute opener. The Indian front three - Mandeep Singh, Dilpreet Singh andAkashdeep Singh - looked in good touch all throughout the game yesterday as they created a host of opportunities up front. However, Canada pulled one back after Floris van Son scored the equaliser in the 39th minute. But once India returned in the fourth quarter, they left the Canadians holding their heads after some blistering attacking play which helped Manpreet Singh’s boys score four goals in the final quarter to end the match at 5-1. After Chinglensana got India ahead in the 46th minute, Lalit put India up by two goals in the very next minute to score his first of the night. Local lad, Amit Rohidas, carefully dispatched a 51st minute penalty to make it 4-1 before Upadhyay finished his night on a high scoring his second and doom the Canadians to a 5-1 loss. Two penalty-corner conversions from the six India created is a decent return so far considering how improved defensive mechanisms of teams has made it difficult to score from PC’s. India will surely keep a couple of variations up their sleeve for the knockouts and will hope to improve the conversion rate in crunch games. Harendra Singh’s boys will play the third quarter-final on December 13 and are likely to face Netherlands or Germany.